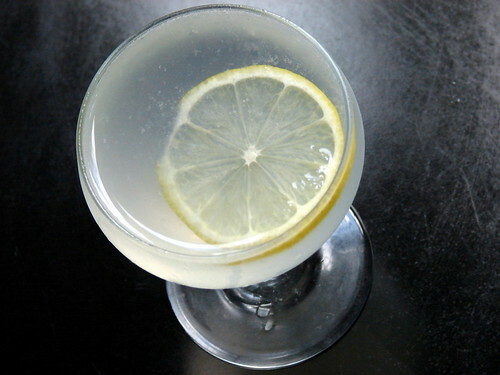 Near the end of his Savoy project, Erik Ellestad featured the XYZ cocktail, a daisy/daiquiri/sidecar variant using rum. The drink sounded great to me, and while browsing through the comments, I saw that someone suggested using Banks 5 Island rum as the base. The original, from the Savoy, calls for lemon juice, Cointreau, and Bacardi. Erik used Clement Creole Shrub in place of the Cointreau. The same person who suggested the Banks, though, also thought that maybe Cointreau or Combier might pair better with Banks because he found the cocktail a little dry. I happened to have a bottle of Banks 5 Island, provided to me as a free product sample, and I wanted to try it in this cocktail. I love Banks. If you’re not familiar with it, it’s a white rum, but it certainly doesn’t taste like one. It has a funky taste you normally expect from a rhum agricole. Banks is actually a blend of rums from five islands: Trinidad, Jamaica, Guyana, Barbados, and Indonesia. Wait. That’s a little misleading. Banks is actually a blend of rums from four islands: Trinidad, Jamaica, Guyana, and Barbados. The Indonesian component is not a rum at all: it’s Batavia arrack, a pot-still distillate made of sugarcane. It’s similar to rum but it’s much funkier. It brings a unique character to Banks 5 Island that you can’t find in other white rums. I find that Banks is great in cocktails. It blends exceptionally well with other ingredients without losing its own character. Unlike most white rums, though, it’s also wonderful sipped on ice or stirred into an old-fashioned. I wanted to try it in the XYZ, though. I mixed it twice, over successive nights. The first time, I tried it with Creole Shrubb. Like Erik’s commenter Sam, though, I found it a little dry that way. So the next night, I mixed it with Combier and — oh my! — that was lovely.